Discussion in 'Amps and Cabs' started by tiktok, May 2, 2016. CV-H, Pa'ani, Steve Hotra and 3 others like this. Great story. I hadn't seen it. I've long loved that guy's Dumble Clips. I agree with AD - he's a great player. Wish there wasn't so much animosity against Mesa Boogie in the article, seems a bit too animus to me. Especially since most early Boogies and Dumbles are the same exact circuit. I guess is the reasoning to try and distance himself from Randal Smith? I do like the comment where its stated he doesn't like the overdrive of a Boogie as if Boogies were around first and he designed to have a better over drive but he always claims his design was first. Sounds like an admission to me. Anyway I will prolly stir up a bunch of Dumble inspired hatred directed at me which is not what I intend, I'm just asking these questions. well you aren't really asking question so much as making accusations.... and as far as I can tell you are doing so based on some inaccurate information. Elantric and Washburnmemphis like this. What accusation am I making? I'm asking why all the animosity and BTW this may be coming from the writer not necessarily Howard. For there to be a good guy there must be a bad guy? when i am 235 years old i will see people playing Boogies, there won't be any Dumb amps around at that time. Is this thread merely an ad for the pedal? Jon Silberman, slybird, Resonance7 and 2 others like this. As much as I love the players who play Dumbles, and the sounds they get....the entire "mystique" of Alexander or Howard rubs me the wrong way. He has every right to do things as he sees it, I just don't have the time for people that demand to be treated as special. We are all just humans, and we should respect each other, and not try to elevate ourselves above others. golfnutt67, Fredrocks, Torren61 and 4 others like this. you guys are acting like you just found santa claus' drivers license. Cgkindler, Fredrocks, slybird and 4 others like this. You don't understand the situation. He is a one man business. He does everything himself. He is a perfectionist. Some people are, some aren't. Being that he builds or built on a very limited basis, he had to decide who to build for and who not to build for. He decided to build for those people he thinks would most appreciate and benefit from using his amps. He loves guitar and guitar music. Look at the people he's built for and you'll understand that. He's not "demanding to be treated special". I don't know where you came up with that. He didn't decide his amps would be the most expensive and desirable amps ever. That just happened due to their quality and limited numbers. wasnt christopher cross, mr 'if you get stuck btw the moon and nyc' himself a dumble customer? was there even guitars on his albums? is that what dumbles sound like? a piano? ok, im just kidding. you guys have fun. Hilltopper, Frankee and Dorion1 like this. 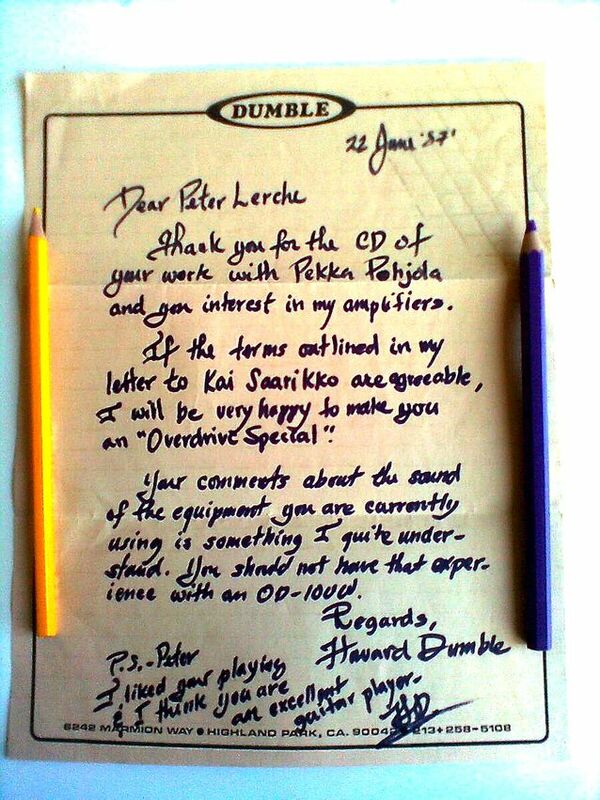 If you guys get a chance dig in to Peter Lerche's albums. Unbelievable and good. If I'm remembering right I think Cross is actually a big time guitar head-59 les paul playing type of guy that can rip on the instrument. Obviously got caught up in the soft rock thing but I think he's more of a guitar guy than his hits would show. (I think he was jamming on Fallon a couple of years ago?). Elantric, crazyneddie and Washburnmemphis like this. You were not to disclose any of your discussions with the maker. You weren’t allowed to open the amp’s chassis. You were obliged to not leave the amp anywhere it could be stolen. You weren’t allowed to sell the amp. I love the guys who have played his amps through the years but the list above, which is just a small sampling of what we KNOW of the hoops you need to jump through to be awarded one of his amps. There are other 1 man shops. It's a personality issue. NamaEnsou, Red Planet and Torren61 like this. Resonance7, NamaEnsou, 1coil and 1 other person like this. Exactly. I prefer to give my money to a certain one that's located in your neck of the woods. Not only does he build a stellar amp, he treats you like a human being too. Curious. Fame has idiosyncratic consequences? Go figure. Would that my work demanded so much 'critique'. * How could you forget the child who knows tone? Phletch and ELmiguel like this. It's ok that you see it that way. I see it the other way. No worries, he refused my order!